Hellion reviews The Host, one of Korea’s top grossing monster flicks of last year and has great things to say. Here’s why this is a must watch movie. Greetings hellspawns and do-gooders! Hellion here, reviewing one of Korea’s top grossing movies of last year, The Host. Plot goes a little something like this, mysterious mutant fish monster surfaces from the contaminated depths of the Han River to terrorize the good hard-working people of Seoul. Sounds like you’re not missing much, huh? WRONG! The Host is not only one of my favorite films from 2006, it could be one of my favorite monster films of all time! Underneath the surface of what sounds like a typical monster film, one finds a biting commentary on the social and the political ills plaguing modern day South Korea, but best of all, it is a beautiful comedy-drama about a typical dysfunctional Korean family. The movie opens with, of course, the U.S. Army dumping tons of toxic chemicals into Seoul’s Han River. The good people are Seoul should be so lucky that only one monster came out of the river. Cut to present day, the Park family food stand, Hie-bong Park, the hardworking grandfather shoos away a little klepto hand trying to steal candy, while his dimwitted son, Gang-du, sleeps instead of attending the stand. There is tender interaction been the frustrated Hie-bong, the incompetent Gang-du and his young daughter Hyun-Seo, home from school. While watching Hie-bong’s daughter compete for her place in the Olympics on television, Gang-du produces a bucket of nickels for Hyun-Seo and announces he’s saving up to buy her a new cell phone. Unfortunately, the grandfather has to scold Gang-du for not doing his job and pushes him off towards the river to offer freebies to offended customers. Moments later, Gang-du is standing on the side of the Han River with other tourists, watching some mysterious presence that has parked itself under a nearby bridge. Whatever it is, it’s moving and suddenly, it dives in the water, swimming up to the tourists. Gang-du throws a beer into the water and a slimy tentacle tail reaches up to grab the beer and pulls it under the water. This fascinates the tourists, who begin to throw more trash at the monster until it swims away. The scene is an obvious stab at society to point out that the Han River is over polluted because of man. Minutes later, the creature surfaces, heads straight for the crowd and our adventure begins. It becomes apparent after the first few minutes of mass hysteria and screams of terror, that this is no Amazonian River Dolphin. The creature is an ugly, slimy, man-eating (sometimes swallowing them whole) cross between the Predator and Street Sharks (yes, that old 90s cartoon). The creature appears to operate on pure instinct, no feelings, no sinister plans, just follows the sounds of the people and eats everyone that gets in its way. One good turn deserves another and in this movie, it’s the fish who like to eat it raw. 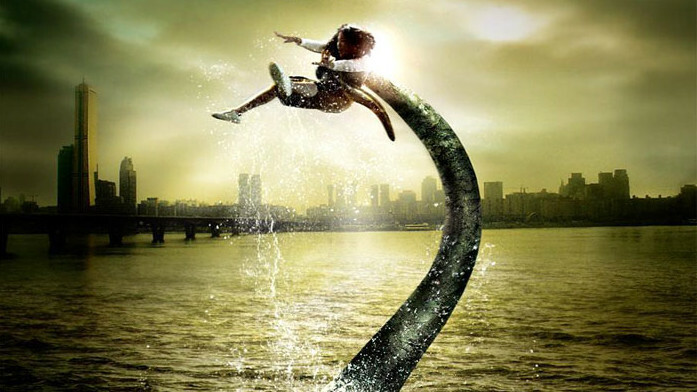 Just before plunging back into the dark water, the creature’s long prehensile tail reaches out and snatches the young Hyun-Seo and they disappear, leaving Gang-du and Hie-bong absolutely stunned. Immediately, we believe the little girl to be dead. The River vicinity is evacuated. The military moves in. The fumigation begins. Miles away in a public gymnasium, survivors are gathered to pay tributes to their loved ones. Those who were in direct contact with the creature are quarantined for fear they have been exposed to a new super virus. While in quarantine, the bumbling Gang-du, agonizes over the death of his daughter until he receives a call from Hyun-Seo’s cell phone. It’s hard to hear her, but it’s enough to convince Gang-du that his daughter is still alive and trapped somewhere in a sewer in Seoul. Unfortunately, doctors believe Gang-du has been infected by the virus and is hallucinating. The Park family go to the extremes to bust Gang-du out of military quarantine. Now on the lam, they set forth to scour the sewers for the youngest member of their clan. Meanwhile, Hyun-Seo waits alone, cold and hungry in a deep, dark sewer, hiding every time the creature return, with God knows what coming out of its stomach. Turns out, the creature acts more like a cow, in that, it regurgitates its stomach contents, sometimes to feed later. This time, among the contents, is the owner of a familiar hand with a penchant for five fingered discounts. One wouldn’t call this a low budget movie by any means, Bong Joon-Ho managed to scrape together plenty of funds to complete his vision. But compared to its American counterparts, this is the type of movie the Studios should be turning out! Instead American audiences get ‘Alone in the Dark,’ (Curious folk, stay away! It’s void of any intelligence and entertainment!) The Host manages to satisfy as both a popcorn flick and an intelligent vehicle for social commentary on Korea. The smart script addresses everything from pollution, militarization, public health policies, to Korean stereotyping. Gang-du is played effortlessly by Kang-ho Song, best known for his role in Sympathy for Mr. Vengeance. Gang-du is a big hearted incompetent fool, who lives a simple life and loves his simple family. He’s the film’s hero and by the end of the movie, the viewers want nothing more than to see Gang-du get his revenge. Another standout performance is Ah-sung Ko, who is wonderful as little Hyun-Seo. This is Ah-sung’s debut film and there’s no question, if she chooses to continue on with her career, we’ll see this bright child star again. Her scenes are probably the movie’s most chilling and that fearful look on her face will make you want to cover your eyes every time. Actually, all the acting is fantastic. Every character is fleshed out. They’re unique, interesting, but you do get the feeling that you’re just scraping the surface of their personalities. Nonetheless, it’s like watching a real family squabble, rather than some actors on a screen pretending to be connected. Veteran American character actors add that extra touch of Americana, you know those damned yanks are always meddling in foreign affairs with disastrous results. The film’s underlying theme is family. No matter how dysfunctional, families need to stick together, support one another, and risk certain death in pitch black sewers for each other. The fine performances are what turn this little monster film into, of all things, a lighthearted family drama. Yes, it’s horror film, a really scary monster movie, which we haven’t seen much of in the past twenty years. However, it’s also a comedy, a drama and even a bit of an action film. The Host is currently available as Region 3 DVD for those with all region playing DVD players. For everyone else, the U.S. Release Date set for July 24 2007. The language is Korean, some English spoken. Subtitles are in English and Spanish. Running time is approximately 2 hours. There are rumors of an American remake. Please do not wait for American film company to butcher this film to see it! Go out and see the original version! There was a time when I hated reading subtitles too, but trust me, you get used to it. When you have a movie this good, you soon forget that you’re even reading subtitles. The chills, thrills and the humor will have you hooked until the bittersweet end. This little gem gets 3’s Golden Pitchfork, that’s five outta five pitchforks! The highest rating a movie can earn here at DeliriumsRealm.